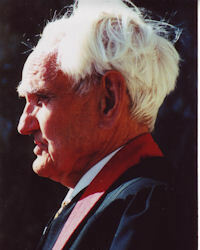 Orril Fluharty, July 2, 1912 – April, 25 2008 served Peascadero Community Church from 1955 to 2008. The scientific community comes to a common conclusion about a subject matter they discussed and the common conclusion, whatever the subject might be, if it is unanimous, then that is a fact. Truth is many time ambivalent. I often think about when you go to court and you get in the witness stand and they tell you to raise your right hand (I don’t like that, I’d raise my left hand if anything) and they ask you, “Do you swear to tell the truth, the whole truth and nothing but the truth,” I won’t swear by that. I would reply by saying: truth is what I perceive to be what I present. But it is my definition of truth. And so we come to loggerheads on many things: what is truth and what is faith and what is love. I think probably the thing that is most accepted by all of us is love. Paul says in his letter to the Corinthians: Now abideth faith, hope, love, these three, but the greatest of these is love. I am a Christian because I believe that Christ was a historical figure in the culture of that period and I believe that Christ died as a criminal on the cross. Not especially for my personal salvation but as a direction toward which the whole world is going to come to. Let’s not stop at the universe but let’s think about what might possibly be beyond so our mind is going to run to the fullest extent of our imagination and what we think or what we support may be imaginary or it might be true. The older I get (and I am a little older) the more I substantiate the fact of the living Christ. Jesus was born, according to the tradition, through the method of immaculate conception. Well, Orril, how about that? This is a controversial subject! Was it immaculate conception fact or fancy? I did a sermon about that named “Missing the Point.” The point of that statement, may it be literally true or imaginary, is this: that we have the ability, the privilege and the joy of knowing that the birth of Jesus was a momentous thing in the lives of Joseph and Mary and Jesus brothers and sisters. This is especially pointed out throughout scripture. The birth and death of Jesus was for our example because to be a Christian means to be Christ-like. And so to be Christ-like we need to emulate and to discern in ourselves our conception of what that birth and death means to us. Paul has emphasized through: the focal point of every statement in the Bible is to project our thoughts toward the Spirit, to the spiritual and then becoming a part of that Spirit. To emulate Jesus is to emulate his willingness to follow what he conceived to be his purpose for living and his purpose for dying and this is not a physical thing (as you can see because I’ve already lived three times as long as Jesus did) It is a spiritual connotation because if Jesus Christ is the same yesterday, today and forever, if that is true, it means the spiritual understanding. Following Jesus means that we are making choices of our own. We are a free people. We are free to choose whatever we want, including sometimes the overuse of drugs or whatever. But we are free to do as we choose and we are free to understand: Jesus Christ is yesterday and today and forever. The emphasis is again on the spiritual, not factuality. I had a conversation with my Grandson from New Jersey talking about God. I asked him how many people are there in the world. And he gave me an estimate and I said, there are probably 4 billion different approaches to what the word God means to the people. Fact and hope become a reality so that these words are synonymous so that these possibilities become a oneness of possibility that is for each and everyone of us to be able live according to Jesus’ spiritual example. I have no excuse for the things that I look back on and now know they were devious from where I needed to be. As I stand before you today, I ask that in the background of all your endeavors and thinking and sometimes your quarreling, that the everlasting Spirit throughout the universe and beyond the universe be inundated us and we in the Spirit. If God be for us, who will be against us: Not one soul because we have made the choice to be aware continuously of that living eternal, powerful all knowledgeable Spirit. What a privilege to belong to this little church family. What a privilege to have compatible family, children, grandchildren, great-grandchildren. I believe that the purpose of that creating Spirit will be complete not by our adverse approaches to the Christian religion, but by our continuous choices that makes life happy, worth living. They see that and they, too, understand that this living spirit that is the essence of love can be the means for peace in the world. It is going to happen.